Cyril Lodowic Burt. Pioneering educational psychologist. The first psychologist to be knighted. 1. An unpublished typescript 'Leaves from the Life of a Woman Doctor by Mildred Barrow'. These are the memoirs of Marion Burt (the sister of Cyril Burt) detailing events in their childhood and an account of her time as a medical student and her early days in practice as a country doctor. The memoirs are pseudonymous (Barrow being the maiden name of her father's mother). There are numerous references to episodes in the childhood of CYRIL BURT (who is here called Laurie - an approximation of his childhood nickname Loddie), his holidays and escapades at home during his time at the Bluecoat School, his going up to Oxford, his cleverness, the devotion of his sister, etc. Also includes poignant and amusing episodes and anecdotes from Marion's life as a medical student and G.P. Cyril Burt's sister is an interesting character in her own right, being one of the first women to work as a medical practitioner. She faced prejudice and not inconsiderable hardship. She never married and, as her diaries (see below) reveal, was exhausted by a life of constant medical work and the care of an increasingly frail mother. She was devoted to Cyril Burt, her elder brother, whom she clearly adored and idolised from an early age. Approx 77pp and with a number of different drafts in addition. 2. An ALS from Marion Burt to her mother, written when a young student doctor at the Birmingham & Midland Hospital for Sick Children. Monday, no month, 1915. 5pp. Giving an amusing account of Cyril's visit. Also detailing the rather unpleasant, patronising treatment she had received from a consulting physician during an autopsy she was conducting (implicitly because she was female) and other episodes. 3. Two documents dealing with hereditary illness and insanity (one being a possible twin study of a case referred to medical examination by the City of Birmingham Education Committee, 28th February 1929, the other being an older hand-written genealogical chart for a family, all of whom had suffered from some form of hereditary insanity). These are almost certainly documents that had belonged to Cyril Burt whose interest in heredity and eugenics had been sparked by visits he made with his father to Francis Galton and his brother, Darwin Galton, the latter being one of his father's patients. 4. Diary of Martha Burt (Cyril's mother) for 1940. Containing references to Cyril's evacuation to Aberystwyth, the storage of his papers (in the attic of her house and at Wallace Cox's Depository in Malvern - apparently due to fire risk). Of some interest due to the controversy that followed his death and the allegation that Cyril Burt had falsified data and the apparent loss of his papers in the bombing of London (see below). Also with numerous references to Cyril's visits and those of his wife, Joyce. 5. Diaries of Marion Burt for 1932, 1940, 1941, 1942, 1943, 1944, 1945, 1946, 1947, 1948 and 1949 (11 volumes). All containing numerous references to visits by Cyril Burt and his wife Joyce, etc. Of particular interest are the references to the evacuation of his department to Aberystwyth, Marion's visits to him in Aberystwyth and London, references to his department and staff, etc. Also with entries relating to the war, local bombing raids, the death of their Canadian cousin in the RAF, her doctor's duties, Cyril's knighthood, the death of their mother and her last words, etc. 6. 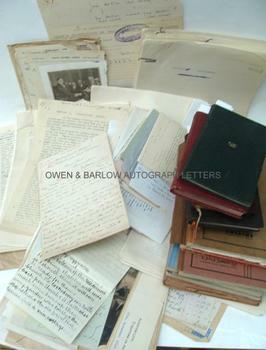 Pages extracted from the diaries of Cyril Cecil Barrow Burt and Martha Burt (the parents of Cyril Burt). 7. Hand coloured photograph of Cyril Cecil Barrow Burt (the father of Cyril Burt). 8. Quantity of documents relating to Snitterfield, its inhabitants and history (the childhood home of Cyril Burt). Includes the original sales particulars for his house, a typescript 'History of Snitterfield, and original letters (ALsS) from local characters ('Blind Tom', etc). 9. A quantity of other various letters and family documents. A fascinating archive of documents and a rich, unpublished source of material for those interested in the life, family and career of this controversial scientist. Sir Cyril Burt was the first educational psychologist and is probably still the best known. He is most famous for his work in the field of eugenics and for his studies of twins and the hereditability of IQ. In 1913, Burt was appointed as the first educational psychologist for the London County Council, with the responsibility for picking out the 'feeble-minded' children in accordance with the Mental Deficiency Act of 1913. During this time, he notably established that girls were equal to boys in general intelligence. His 1925 book, 'The Young Delinquent', led to the opening of the London Child Guidance Clinic in Islington in 1927. He is also credited with pioneering the 'eleven plus' examination system. The work of Cyril Burt in eugenics was the chief influence on Hans Eysenck and others. Shortly after he died, however, his studies of inheritance and intelligence came into disrepute after evidence emerged suggesting that Cyril Burt had falsified research data (the 'Burt Affair'). This was impossible to substantiate, either way, as the notes, records and research documents relating to Burt's studies of twins were said to have been lost as a result of bombing during the WW2 London Blitz, whilst his university department had been evacuated to Aberystwyth in Wales. This archive of documents, however, casts some interesting doubt on this, as it seems that a lot of Burt's papers were not stored in London at all but were kept initially at his mother's and sister's home in Malvern. Following anti-incendiary regulations prohibiting storage of papers in attics, it appears these were subsequently removed to local storage. It does seem that his mother became a little fretful over the cost of this storage and we speculate that some papers may have been destroyed or fell victim of local paper drives. Scholars have since asserted that Cyril Burt did not commit an intentional fraud and, in general, his reputation as the first and most influential of educational psychologists is now fully restored. From the studio archive of Catherine Moody and her father, the artist Victor Hume Moody, successive principals of the Malvern School of Art. The Moodys were near neighbours and friends of the Burt family and Marion Burt practiced as a G.P. in the area around Malvern. Cyril Burt, as a boy, had lived in Snitterfield, a village about 30 miles from Malvern, where his father was an apothecary before becoming a medical practitioner . His mother and sister subsequently settled in Malvern. The two families appear to have had close ties (and may have been related) and Catherine Moody cared for Marion Burt in her final illness. Marion Burt never married and after her death a quantity of her personal papers, including this archive, were retained by Catherine Moody.